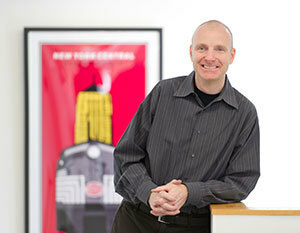 Robert Sedlack, professor of visual communication design, died Saturday (May 30) in his sleep at his home in South Bend. He was 47. A native of Greencastle, Ind., and a 1989 Notre Dame alumnus, Sedlack earned a master of fine arts degree from Indiana University in 1993, and worked in design firms in Chicago before joining the Notre Dame faculty in 1998. Although nationally and individually recognized for his design work, Sedlack regarded all of his teaching and research projects as collaborations, and he directed Notre Dame’s undergraduate and graduate design students in course work that engaged such social issues as racial discrimination, gun control, voter participation, xenophobia, rights of immigrants, and the social stigma of HIV/AIDS. Students in his design classes partnered regularly with local organizations such as the South Bend Center for the Homeless and the Juvenile Justice Center, as well as with foundations in South Africa and Haiti. Sedlak’s service to Notre Dame included a project he led in 2001 to redesign icons of the University’s visual identity, including its official shield, typography, and color palette. Earlier this year he received the Center for Social Concerns’ Ganey Faculty Community-Based Research Award and the Sheedy Excellence in Teaching Award, the highest honor in the College of Arts and Letters. Sedlack is survived by his wife, Theresa, and their two children, Emma and Trey. Updated: Visitation will be held Wednesday (June 3) at the Basilica of the Sacred Heart from 4-6 p.m., followed by a wake service at 6 p.m., ending at 6:30 p.m. A funeral Mass will be celebrated Thursday (June 4) at 9:30 a.m. at the Basilica of the Sacred Heart, followed by burial in Cedar Grove Cemetery. Originally published by Michael O. Garvey at news.nd.edu on May 31, 2015.